There was always a financial cost to early adoption. Today, there’s a potential privacy cost, too. I recently installed a Nest thermostat in my house. Nest has been around for a while, but I’ve been hesitant to get one. I won’t go into the details of why we finally pulled the trigger, but it made sense to have more control of our home environment. When the box arrived, I was excited. I felt like I was stepping into the future. Once I got it all wired up and began the setup, though, my original hesitation came flooding back. Nest would like to use your location. I almost bailed. This is when Nest stopped feeling like a fun, helpful device and started to feel like an intrusive portal. Yet another keyhole for a company (or whomever else) to peer into my family’s life. It was probably okay, I rationalized. It’s probably just sharing location and temperature data, I thought to myself. I wouldn’t have had this conversation with myself a decade ago. As the internet grew and the iPhone came on the scene, it was exciting. I felt a reverence, almost gratitude for everything it enabled. Driven by curiosity and optimism, I signed up for any new service just to see what the future might hold. I was on the leading edge of early adopters. Over the past few years, however, I’ve drifted away. I’m not the only one. There’s always been a financial cost to early adoption. My uncle amassed a collection of LaserDiscs, only to have to start over when DVDs won. For him, the long-term impact was limited: some money out of pocket and a slightly bruised ego. Now, the equation is very different. The cost of a new device is no longer just financial: it’s also deeply personal. When Amazon says, “Don’t worry, Alexa isn’t listening all the time,” we have to decide if we trust them. When Facebook launches a video chat device days after announcing a security breach impacting 50 million user accounts, we have to decide if we’re willing to allow them to establish an ever-present eye in our home. When we plug in a new Nest thermostat for the first time, we have to decide if we are okay with Google peering into our daily habits. The cost of a new device is no longer just financial: it’s also deeply personal. 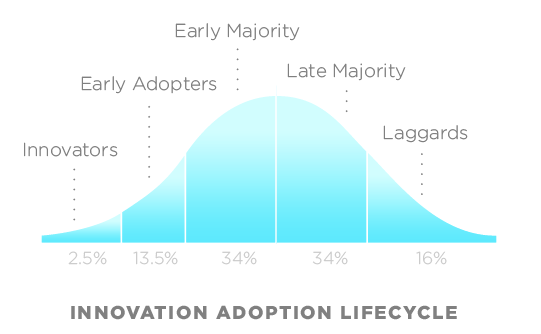 The adoption of new technologies is often represented on a normalized curve, with roughly 16 percent of the population falling into what is broadly characterized as early adopters. Early adopters, as Simon Sinek puts it, are those who just get it. They understand what you’re doing, they see the value, and they’re here for it. The further you move into the curve, from the early majority to the laggards, the more you need to convince people to come along. Early adopters have an optimistic enthusiasm and a higher tolerance for risk, both financial and social (remember the first people walking around with Google Glass?). It’s relatively easy to acquire them as customers. It doesn’t take a sophisticated marketing apparatus or a big budget to get them on board. As Sinek says, “Anyone can trip over [the first] 10 percent of the market.” Early adopters are critical because they create the fuel that allows an idea to gain momentum. Early adopters provide initial cash flow and crucial product feedback, and they help establish social proof, showing more cautious consumers that this new thing is okay—all at a comparatively low cost of acquisition. For a new product to find true mass market success, it has to move out of the early adopter group and gain acceptance in the early majority. This is sometimes referred to as crossing the chasm. Early adopters give new technologies the chance to make that leap. If companies had to invest in marketing to acquire more reticent consumer groups, the barrier to entry for new ideas would grow dramatically. But what if early adopter enthusiasm began to erode? Is that optimistic 16 percent of the population immutable? Or is there a tipping point where the risk-to-value ratio flips and it no longer makes sense to be on the cutting edge? There was something different about the Facebook Portal launch. When the new video chat device hit the market, Facebook didn’t make a play for the typical early adopter group—young, tech-savvy consumers. Instead, they targeted the new device toward a less traditionally “techy” audience — older adults and young families. You could make a lot of arguments as to why, but it comes back to the core principles of early adopters: they get what you’re doing, they see the value, and they’re here for it. For Facebook, mired by endless scandals and data breaches, it became clear that the traditional early adopters did get what they were doing, but instead of value they saw risk, and they weren’t here for it. Facebook chose to target a less traditional demographic because the company felt they were less likely to see the possible risks. Facebook Portal is a paragon of the new cost of early adoption. The product comes from a company whose relationship with consumers is shaky at best. It carries a lot of privacy implications. Hackers could access the camera, or the company could be flippant and irresponsible with the use and storage of video streams, as was reported with Amazon Ring. On top of that, Portal is not just a new device, but also a new piece in the ecosystem of Facebook products, which represents a bigger underlying hazard that is even harder to grapple with. Today, each new device we purchase is a conscious decision to share an intimate piece of ourselves with a company whose goals may not align with our own. As the technology ecosystem has grown, the number and types of devices we feed our personal data into have expanded. But, as linear thinkers, we continue to assess risk based on the individual device. 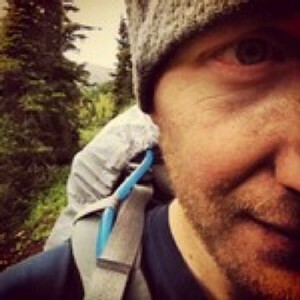 Take my internal dialogue about the Nest thermostat. My inclination was to assess my risk tolerance based on the isolated feature set of that device — tracking location and temperature. In reality, the full picture is much broader. The data from my Nest doesn’t live in isolation; it feeds back into the ever-growing data Frankenstein that Google is constructing about me. My Nest data is now intermingling with my Gmail data and search history and Google Maps history and so on. Various A.I. munges this data to drive more and more of my life experience. A product ecosystem means the power inherent in a single device is no longer linear. As each new device folds into an increasingly intimate data portrait, companies are able to glean insights with each new data point at an exponential rate. This potentially translates to exponential value, but it also carries exponential risk. It’s hard, however, for us to assess this kind of threat. Humans have difficulty thinking exponentially, so we default to assessing each device on its own merits. All of this means that to be tech-savvy today isn’t to enthusiastically embrace new technology, but to understand potential hazards and think critically and deeply about our choices. As Facebook Portal illustrates, that shift has the potential to change the curve of technology adoption. Nearly half of the 5,000 U.S. consumers aged 13 and older who were surveyed by MusicWatch, 48 percent specifically said they were concerned about privacy issues associated with their smart speakers, especially when using on-demand services like streaming music. Yet, despite our misgivings, technology marches on. Our concerns about smartphones have not slowed their growth, and MusicWatch found that 55 percent of people still reported using a smart speaker to stream music. What was really concerning to me was this idea that “it’s just a little bit more info you give Google or Amazon, and they already know a lot about you, so how is that bad?” It’s representative of this constant erosion of what privacy means and what our privacy expectations are. We’ve been engaged in this tug-of-war for years, pitting that persistent feeling of concern at the back of our minds against our often burning desire for the new. The coming decade may prove a litmus test for our long-term relationship with technology. For years we have chosen to trust corporations with our personal data. Maybe it’s a cultural vestige of the technological optimism of postwar America, or maybe we are so eager to reach the future we’ve been promised that we are operating on blind faith. But there are signs that our enthusiasm is cracking. As we continue to hand over more of ourselves to companies, and as more of them fail to handle that relationship with respect, does there come a point when our goodwill dries up? Will trust always be something we give, or will it become something that must be earned? At what point does the cost of adoption become too high?